The wet weather dominated when I wrote in November but no-one I think anticipated the storms that would engulf Cumbria at the beginning of December. It was so sad to see the floods happening all over again and this time on a wider scale. However on a local level here it is incredible to see how quickly Cockermouth Main Street is recovering, most of the shops were up and running and people smiling again within a few days. 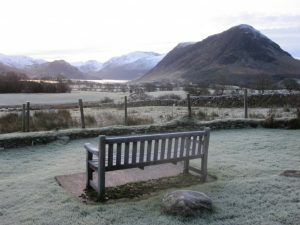 During the year I have put up a lot of photos taken by the seat in front of Foulsyke, here is one taken on a very frosty morning last week.